"No one can serve two masters. Either he will hate the one and love the other, or he will be devoted to the one and despise the other. You cannot serve both God and money." "Watch out for false prophets. They come to you in sheep's clothing, but inwardly they are ferocious wolves. By their fruit you will recognize them." "They also will answer, 'Lord, when did we see you hungry or thirsty or a stranger or needing clothes or sick or in prison, and did not help you?' He will reply, 'I tell you the truth, whatever you did not do for the least of these, you did not do to me." And you are to love those who are aliens, for you yourselves were aliens in Egypt. When an alien lives with you in your land, do not mistreat him. The alien living with you must be treated as one of your native born. Love him as yourself, for you were aliens in Egypt. I an YHWH your God. I realized the other day that I hadn't written anything in over 2 months. Mostly due to the Holidays, then the gloom of January and what not. But also because I was waiting for something hopeful and inspiring. Most of my last few post have been negative. Especially since the election of President Voldemort. I was hoping for something uplifting, but instead I got a news full of more Debbie Downer. Once again, it was from "Christian" leaders. 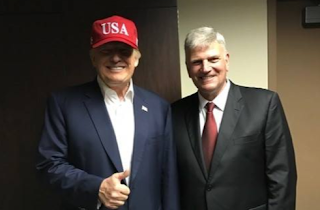 I've had growing issues with Franklin Graham for a lonnnnnnnng time. When he first took over for his father, I thought he was the coolest thing since sliced bread. He had always been a bit of a rebel, and I liked that. Also, his charity, Samaritan's Purse really does some good work. So I was extremely hopeful that he would continue his father's work of simply helping the needy and preaching the Good News of Jesus' kingdom. Unfortunately, it didn't take too long for the polish to start coming off. It was many years ago, but it was during the time of the elder Graham's retirement. Franklin and others wanted to build a museum to chronicle the history of Billy's ministry. Nothing wrong with that. However, Billy didn't want anything ostentatious or too fancy. In fact, he had a very simply museum planned. Franklin didn't want to go along with that. Instead, he built a rather fancy museum on land that Billy had no interest in. I thought that was a little weird. Then, there came the issue of money. Billy isn't poor by any means. He was a paid a basic salary for his work in the ministry, with the vast majority of his income coming from sales of his books. There is absolutely nothing wrong with that. You make something yourself, and someone buys it. Good for you! That's how basic economics works. $880,000 a year for running a "Christian" charity?!?!?!?!? I'm all in favor of paying a guy for a good job, but that seems more than a bit excessive for a "Christian" charity that is supposedly set up to help the most vulnerable people on the planet. It just seems that you could take some of that salary and spend it on people who could really use it...like the people that charity is supposed to help. Rick is an interesting guy. He make's his living off his writings and has paid back his church every penny they paid him for the years of his preacher salary. Now, he preaches for free and STILL donates most of his money away. That's what I call a "Testimony." Rick isn't alone in giving most of his money away. Francis Chan has the same nasty habit. A few years back, he sold his house to buy a smaller one for his family...all the while hosting young men that he was mentoring with his family. There are others. Rick McKinley of the Imago Dei Community in Portland. Dan Kimball in S.Cal. They have very successful ministries, but keep money at arm's length. Franklin has stated publicly that he wants to make enough money so that he can work for free once he hits 70. Billy is worth an estimated $25 million. Franklin is a multi-multi millionaire. Don't know about you, but if I had a couple million in the bank, I might just quit my job as a butcher and go volunteer in a soup kitchen for a few years. How much more money do you need before you can work for free? I know that roughly 1 billion people on the globe lack access to clean drinking water. Wells to gain access to clean drinking water only cost a few hundred dollars. Seems to me that there was a better way to spend a hundred million dollars to proclaim the Gospel. 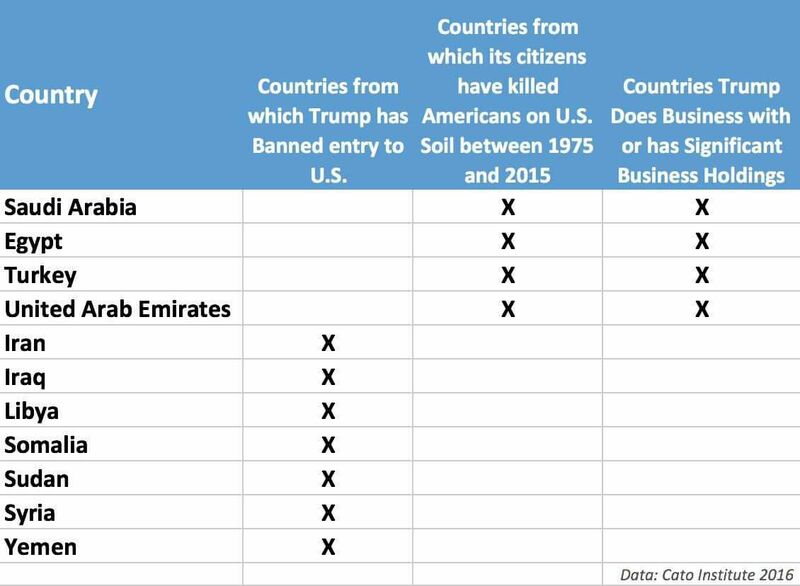 In the past few days, President Voldemort has issued a ban on immigrants from Muslim Majority countries...unless they are not Muslims. I'm not much into conspiracy theories, but you have to admit that this choice of countries is a bit odd. Franklin Graham has come out and publicly backed Voldemort in this ban over the past few days. Why? 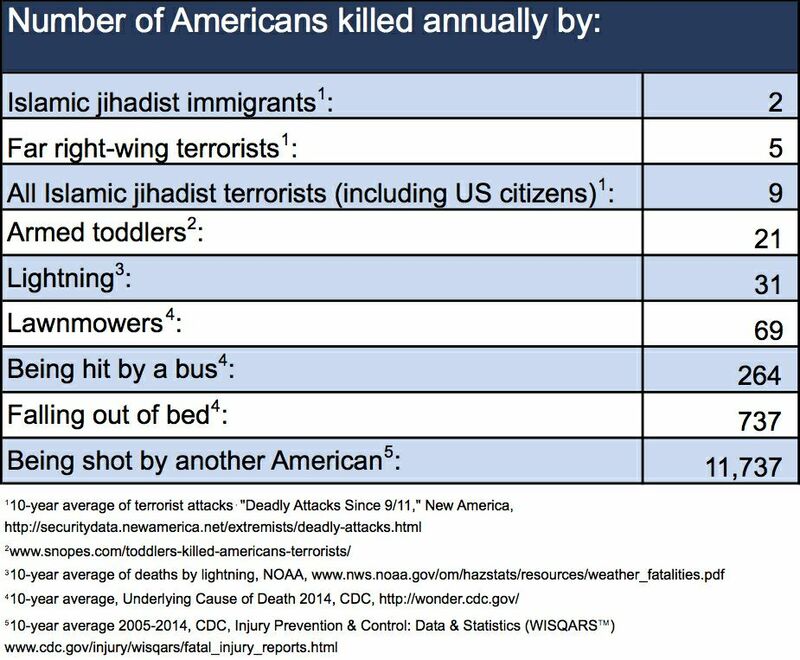 Because Muslims are dangerous...as demonstrated by the chart to the left. 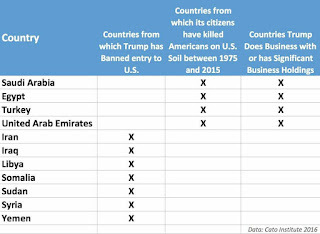 Now the ban does allow for non-Muslim, minority folks...like "Christians" to come as refugees (Nice double standard there.) from these Muslim majority countries. Franklin says that helping these refugees is not a biblical issue. Oh???? This from the same man that has been touting the March for Life in Washington D.C. this past week. This from the man who claims to be "Pro-Life" and getting a Supreme Court Justice that will "Hopefully" overturn Roe V. Wade. "Life" is precious to this man...so long as it's in an American woman's womb. It seems to me that people fleeing the slaughter in Syria, and the misery of other trouble Muslim countries are alive. Do their lives not count? Please do NOT tell me that you are "Pro-Life" unless you truly mean it. Franklin Graham truly does NOT mean it. And he's proved it over the past few days. I don't get it. I really don't. I live about a mile from a mosque. I like to shop at the Halal market next to it. (Halal is to Muslims what Kosher is to Jews.) I buy my gas at a station run by a Shiite from Lebanon. 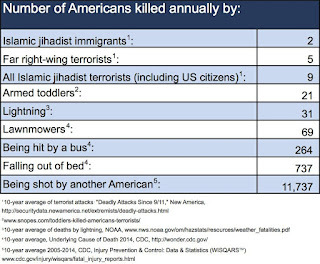 I don't find them to be particularly dangerous. I have heard Pastor after Pastor, and Missionary after Missionary saying that God is bringing these Muslim refugees to our country so that they can hear the Gospel without fear of death. I believe that! I believe in a God that can create something beautiful out of even the worst of human caused misery. Through the death and resurrection of Jesus, anything can be made beautiful. I just wish that guys like Franklin Graham believed it, too. To him and others that live in fear, and have sold their ministries to politicians and the all-mighty dollar, I would simply say to them what Jesus said to certain religious leaders in his time; "You are in error because you do not know the Scriptures nor the power of God."